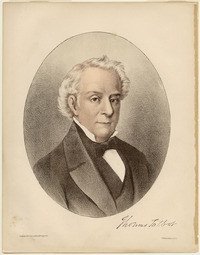 TALBOT, THOMAS, army and militia officer, settlement promoter, office holder, and politician; b. 19 July 1771 in Malahide (Republic of Ireland), son of Richard Talbot and Margaret O’Reilly; d. 5 Feb. 1853 in London, Upper Canada. An aristocrat by birth, Thomas Talbot was descended from a noble Anglo-Irish family which had ancestral lands in Ireland dating from the 12th century. He was the fourth son in a family of 12 children and enjoyed a secure childhood in Malahide Castle, the family seat, where he received his early education. On 24 May 1783, at the age of 11, he was commissioned ensign in the 66th Foot. With the American revolution drawing to a close, he was retired on half pay shortly after his promotion to lieutenant on 27 September. He then resumed his formal education, attending for several years Manchester Free Public School in England which had many paying pupils from well-to-do families. In 1787 he was selected, largely through family influence, as an aide-de-camp to a distant relative, the Marquess of Buckingham, lord lieutenant of Ireland. Talbot thereupon assumed the commission of lieutenant in the 24th Foot. 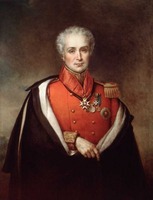 During his two and a half years of service under Buckingham, he became fast friends with a fellow aide, Arthur Wellesley, later the Duke of Wellington. In Dublin, Talbot enjoyed the active social life of an aide-de-camp and emerged from it with a full complement of social graces combined with the confidence of a member of the Anglo-Irish aristocracy. In 1790, the year after Buckingham’s resignation, Talbot joined his regiment on garrison duty at Quebec and the following spring moved with it to Montreal. 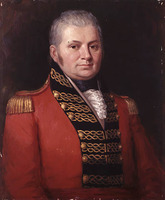 Partly on Buckingham’s recommendation, the first lieutenant governor of Upper Canada, John Graves Simcoe*, named Talbot as his private secretary in February 1792. 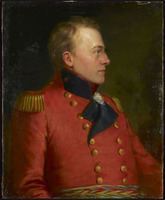 The young lieutenant was thus provided with unlimited opportunities to travel throughout the new province and to impress Simcoe with his abilities. The bond forged between the two men over the next four years seems crucial in explaining Talbot’s subsequent actions. 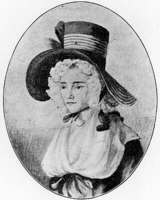 In June and July 1792 he accompanied Simcoe and his wife, Elizabeth Posthuma Gwillim*, to Newark (Niagara-on-the-Lake), Upper Canada’s first capital. Simcoe had planned to locate the capital at the head of navigation on the Thames River, the later site of London, and with Talbot and others undertook an overland expedition to that area and to Detroit in early 1793. 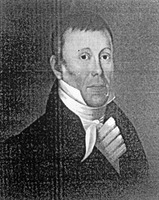 Talbot was subsequently sent on several missions to the western end of Lake Erie to parlay on Simcoe’s behalf with the Indians and to meet the Indian agent Alexander McKee*. He travelled as well to Philadelphia as Simcoe’s courier to the British plenipotentiary, George Hammond. 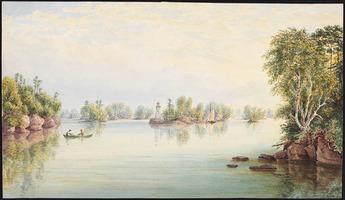 Travelling by land and water in considerable freedom undoubtedly gave him the chance to observe and make inquiries about the region north of Lake Erie, where he would eventually live. In the early summer of 1794 Talbot, then 22, left Simcoe’s staff. The previous fall he had been promoted captain in the 85th Foot and on 6 March 1794 received a further rapid promotion to major. Returning to England in September he subsequently served for two years on active duty: in Holland fighting the French, in Gibraltar on garrison duty, and in England. On 12 Jan. 1796 he purchased a lieutenant-colonelcy in the 5th Foot. He remained in England until September 1799 when war with France again took him to Holland. After the withdrawal of the British later that year he continued to live in England but on Christmas Day 1800 abruptly sold his commission. Almost immediately, at 29, he left to establish himself as a settler in Upper Canada – a sudden change in career that surprised most of his circle. 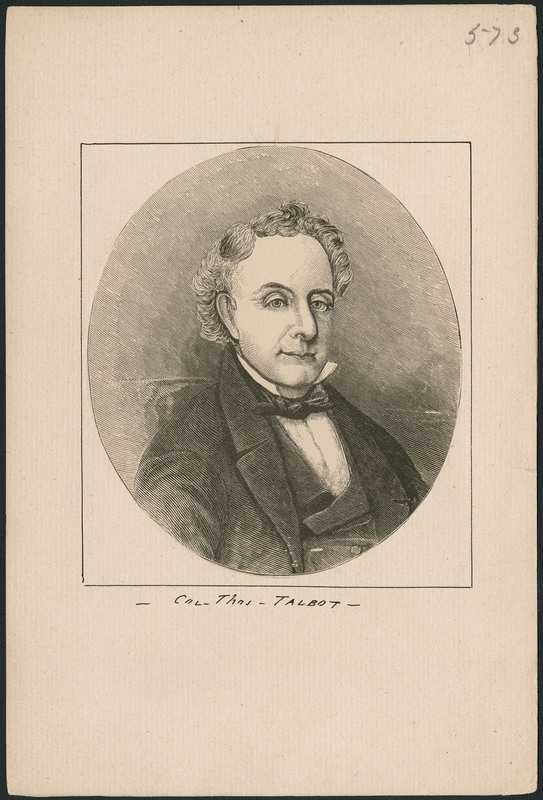 The precise reason for Talbot’s decision is unknown, although several theories have been proposed, including disappointment in love, thwarted political ambitions, failure to advance further in the military, and (as Talbot himself claimed) a desire to assist in the progress and development of Upper Canada. Talbot began farming in 1801 at “Skitteewaabaa,” believed to be near the mouth of Kettle Creek on the north shore of Lake Erie. He apparently hoped to assume a role that would fit in with Simcoe’s attempt to institute in the 1790s a system by which entire townships were granted to prominent individuals who, as local gentry, would select settlers and allocate land. Disappointed that Simcoe had not reserved land for him, he soon contacted prominent individuals in England such as the Duke of Cumberland (the fifth son of George III) and Simcoe himself. Promoting his intention to bring in British rather than American settlers (and thereby, in the spirit of Simcoe, check “the growing tendency to insubordination and revolt” in Upper Canada), Talbot succeeded in obtaining a field officer’s grant of 5,000 acres in May 1803. He selected his grant in the townships of Dunwich and Aldborough, in Middlesex County, and that same month settled at the mouth of Talbot Creek in Dunwich, the site of Port Talbot, his home for the next 50 years. To stimulate settlement in these townships, he acquired mill machinery in 1804 and two years later constructed a water-powered grist-mill which was of great value to the emerging settlement until its destruction by American troops in 1814. In 1807, however, he began ignoring the original terms of the scheme when he located settlers outside his 5,000 acres. Apparently, in the fashion of Anglo-Irish nobility, he wanted to create a demesne around his residence to insulate him from ordinary settlers. Although he had expressed to Simcoe in 1802 a desire for “the ultimate establishment of a comfortable and respectable tenantry around me,” it was necessary to Talbot to maintain a suitable distance between Port Talbot and his settlers. In 1842 he was to explain to John Davidson, commissioner of crown lands, that “within my home Belt, . . . . I do not like to have settlers, as I find too near Neighbours a great nuisance.” The provincial government acquiesced in Talbot’s departure and agreed in 1808 to grant him 200 acres as remuneration for each family settled, whether located within his original grant or not. He thus extended his own potential acreage. About this time the government also accepted his practice of claiming and privately allocating land without registering the transfers at the Surveyor General’s Office in York (Toronto) – the sole record being in Talbot’s possession. In these early years of the settlement the rate of growth was extremely slow (between 1803 and 1808 he had placed only 20 families) and settlers did not choose to take up 50-acre lots when they might obtain 200-acre lots elsewhere in the province. Talbot seemed keenly aware that his isolated holdings required road links to other settlements. Earlier efforts to deal with that sort of problem, such as Simcoe’s Yonge Street, were well known to him. In 1804 he secured his appointment as a London District road commissioner and was instrumental in planning a southerly and topographically superior alternative to both Dundas Street and the Commissioners Road, which linked the district’s middle townships to the head of Lake Ontario. On 15 Feb. 1809 Talbot and Robert Nichol* received provincial commissions from Lieutenant Governor Francis Gore to determine the exact route of the proposed road, which would join Port Talbot and the Niagara District. The Talbot Road east, as it became known, was approved that month by the Surveyor General’s Office and was surveyed by Mahlon Burwell*. As a provincial commissioner Talbot was also responsible for supervising the allocation of lots adjacent to the road. He succeeded in having all provincially reserved lots moved back from the road, as had been done with Yonge Street, and by late 1810 there were numerous settlers with lots along the route. Talbot had to report on the settlers’ progress in fulfilling provincial settlement duties, which comprised the erection of a dwelling and the clearance of land within two years of allocation. By these activities he extended his geographical area of influence far beyond Dunwich and Aldborough townships. Talbot was assisted in extending his superintendence of land settlement by his close friendship with Gore. In 1811, instead of proceeding formally through a recorded order-in-council, Gore verbally authorized the construction of two other roads: the Talbot Road north, linking Port Talbot to the Westminster Township settlement in the upper Thames River valley, and the Talbot Road west, leading to Amherstburg on the Detroit River. At the same time Talbot gained his permission to superintend the allocation and settlement of vacant crown land in concessions remote from the Talbot Road east in Yarmouth, Malahide, and Bayham townships. Gore’s authorization stimulated Talbot to immediate action and, informing Surveyor General Thomas Ridout* of his scheme, he quickly proceeded to have the new roads surveyed by Mahlon Burwell and to locate settlers on lots alongside the roads and in concessions farther back. The consequences of these actions were both profound and long lasting. A storm of protest, which embarrassed Gore and infuriated Talbot, came from provincial officials who had not been told of Gore’s commitments and who had already allocated lands in Malahide and Bayham. The matter was not readily settled, partly because of the outbreak of the War of 1812. During the war Talbot carried out routine duties as commander of the 1st Middlesex Militia and supervisor of all the militia regiments in the London District. The government continued to show close interest in the progress of settlement on the lands under Talbot’s supervision. In 1815 and 1817, at the request of Gore, Talbot submitted to Ridout returns of the settlers he had located, revealing for the first time the size and rate of growth of his settlement. The 1815 return named 350 families and two years later the total was 804. A large proportion had not been issued fiats for land and thus were unknown to the provincial authorities. Furthermore, the payment of grant, survey, and patent fees to the government by numerous settlers, amounting to over £4,000 by 1818, was being arbitrarily blocked by Talbot, who wished to retain full control over the settlers until they had completed their settlement duties. After 1817 the provincial government became increasingly concerned about the collection of internal revenue and doubled its efforts to retrieve fees from settlers. New regulations emphasized fee payment rather than actual residence and were therefore anathema to Talbot. 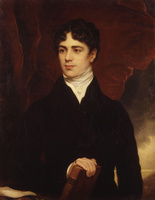 Faced with considerable opposition at York, he travelled to England early in 1818, partly on the advice of the Reverend John Strachan*, who thought he should “go home at once and get the matter settled, if he considered himself aggrieved.” He obtained the support of Lord Bathurst, the colonial secretary, who recognized the value of his work, endorsed his system of personally selecting settlers and withholding their fees, and even permitted him to claim the vast area (over 65,000 acres) of Dunwich and Aldborough that had been reserved in 1803. Thus the extraordinary procedures which he had been using for more than a decade were given official sanction, much to the chagrin of hapless provincial officials. Eventually his authority was extended to include the placing of settlers on land grants and the sale of crown and school reserves. The consequences of Bathurst’s decision were manifold. For the government it meant a reduction in revenues because of the withholding of fees. As for the process of settlement, Talbot’s set of large-scale township plans, on which he pencilled the name of each settler fortunate enough to be selected for a particular lot, remained the only record of land transactions under his supervision. Not only the allocation but also the forfeiture of land, without provincial involvement and by an easy rubbing out of the name, was thus theoretically possible but the number of settlers ousted by Talbot is not certain. His plans were not examined by the Surveyor General’s Office until at least the mid 1830s and they remained in his possession until his demise. 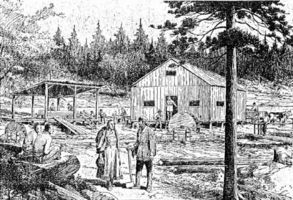 The system thus allowed the non-registration of property titles for many individuals and the absence of any provincial record of alienation for large areas of crown land. Yet most settlers appear to have been content with Talbot’s method of land transfer. They performed the settlement duties, established farms, and did not press for formal evidence of land title, partly perhaps because of the trust they placed in Talbot. Examples exist where two or three decades passed between the initial settlement of lots and the issue of land patents. By 1828 Talbot’s personal land acquisitions had been terminated despite his vigorous appeals to imperial authorities. His settlement extended over 130 miles from east to west and involved portions of 29 townships in southwestern Upper Canada. He never controlled land allocation and settlement in an entire township, but some – Dunwich, Aldborough, Bayham, Malahide, and London – had large portions under his supervision. Official assessments of the extent of Talbot’s work were provided in 1831 and 1836. The author of a report prepared for the British government in 1831 on land settlement in the British North American provinces commented favourably on the progress of the Talbot settlement but noted fee arrears in excess of £35,000, the payment of which Talbot had been blocking, and suggested that an account of his “landed concerns” be provided. Such a tabulation, made for the provincial assembly in 1836, revealed a total of 519,805 settled acres (excluding Talbot’s personal holdings in Dunwich) on 3,008 lots in the 28 remaining townships. The statement did not describe the reserve land sold by Talbot. More important, it indicated that 63 per cent of the 3,008 lots had not been reported to the surveyor general as settled and that only a quarter of them were patented in spite of lengthy occupation in many instances. 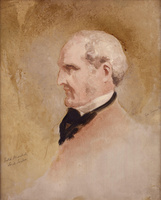 Talbot’s power of supervision was ended in 1838 when Lieutenant Governor Sir Francis Bond Head*, against the advice of his council but with the support of the colonial secretary, Lord Glenelg, asked Talbot to wind up his affairs and turn the settlement over to the province. It had become too large to be managed by an ageing man whose records were inaccessible. Head’s decision was also prompted by the controversy surrounding Talbot’s forfeiture in 1832 of lots he had allocated to four settlers. They appealed his decision and successive provincial administrations deliberated the question of abuse of power. He had clearly acted unjustly in the case of John Nixon, whose land he had forfeited owing to his strong distaste for Nixon’s reform politics, and political antipathy may have played a significant part in two of the other cases. Talbot’s removal appears to have encouraged large numbers of settlers to complete their settlement duties (or claim they had) in order to obtain full title to their land, but it did not detract from his significant record of achievement or his own singular image. Talbot represented the aristocratic, 18th-century British landowner in the New World. The more than 65,000 acres he had acquired by 1821 in the townships of Dunwich and Aldborough were viewed by William Dummer Powell* as his “palatinate” and by John Strachan as his “Princely domain.” Although Talbot’s holdings in these townships undoubtedly retarded the progress of farming there, he appears to have allowed those who settled early outside his holdings a free choice of location. They chose good land close to kinsfolk and mill-sites. Despite his original intention to settle only British subjects, Talbot accepted from the outset large numbers of Americans, whose prowess as settlers he had quickly recognized. Further, Talbot was virtually excused by the imperial government from observing the province’s post-war regulations which prohibited most Americans from taking the oath of allegiance and acquiring land in Upper Canada. Nevertheless, even if American-born settlers, many of loyalist background, predominated in the Talbot settlement in 1820, after 1815 increasing numbers of British immigrants started to arrive, altering its character. Certain areas became distinctively Scottish, English, or American as social propinquity and farming background influenced choice of land. Highland Scots, for example, initially accepted poor land in 1818 in small (50-acre) lots in Dunwich and Aldborough but later became indignant at the size of the grants, their isolation within Talbot’s undeveloped holdings, and the delay in issuing patents, and this indignation resulted in profound antipathy to Talbot over several subsequent generations. Talbot was always concerned with property and wealth and their acquisition. In 1804 he had expressed to Simcoe his wish to be recommended for the Executive Council rather than the Legislative Council as he did “not like working for nothing, and . . . the £100 is as well to have as not.” In 1822, finding his financial position weak, he appealed directly to Lord Bathurst for a pension, clerical assistance, and the remission of fees which he had paid on his own lands. Four years later only a pension was granted, £400 annually. In 1832, with cash from the sale of cattle, Talbot was able to build a new house. He never married but, in the hope of keeping the farm within his family, he brought a nephew, Julius Airey, to Port Talbot in 1833. The youth stayed for almost eight years but could not take to the isolated existence. 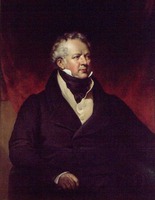 His elder brother, Captain Richard Airey, who was stationed in Upper Canada, was a frequent visitor to Port Talbot in the 1830s. In 1843 Talbot first invited him to live there and four years later promised to pass on his estate to him. Airey and his large family arrived in late 1847, displacing Talbot from his house. In May 1848, accompanied by George Macbeth* (at once his servant, companion, and estate manager), Talbot left for an extended visit to England, his first in 19 years. After 10 months they returned and in October 1849 Talbot attended as guest-of-honour the groundbreaking of the Great Western Rail-Road at London. In early 1850 Talbot quarrelled with Airey, perhaps over differences in their styles of living, and on 16 March he conveyed to him only half of his estate (almost 29,000 acres). The remainder, valued at about £50,000, was bequeathed to Macbeth with the exception of an annuity for the widow of a former servant, Jeffrey Hunter. After a period of sickness Talbot again went to England with Macbeth in July 1850. The Aireys left Port Talbot in April 1851 and that summer Talbot returned to his cherished preserve on Lake Erie. 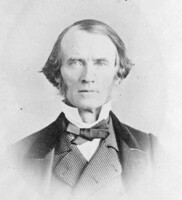 Although a new district had been separated from the London District in 1837 and named in his honour, he was disappointed in 1851 when the new county created from Middlesex was named Elgin, after the governor of Canada, rather than Talbot. Macbeth and his wife moved to London in 1852 and they took Talbot with them. He died at their home at the age of 81 and was buried in the Anglican cemetery at Tyrconnell, a few miles west of Port Talbot. Thomas Talbot was, and is, an enigmatic character whose deeds are far better known than his personality. He left no autobiography or reminiscences and his bachelorhood dictated no legacy of family recollections. Certain eccentricities – alcoholism, snobbery, reclusiveness, and alleged misogyny – have featured prominently in various biographies and may have warped the public view of his character. But whether these traits were as important to his make-up as has been suggested is open to question, possibly with no satisfactory answer. Talbot was clearly the product of a privileged, aristocratic upbringing which may well have implanted in him strong feelings of superiority that prevailed throughout his life. These feelings may have been especially obvious in the pioneer society of Upper Canada, where few of his peers ventured let alone resided. His impeccable pedigree was probably a lifelong support. In spite of his geographical isolation he was recognized, visited, and entertained as an aristocrat, until his death, by eminent men and women in both Canada and Britain. Talbot maintained geographical and social isolation at the local level in the manner of a British lord. To many visitors he was arrogant, impatient, and rude, without reverence for nationality or social status, but to others he was a gentleman, fully cognizant of the social graces. He appears to have been attracted to a number of ladies before emigrating and subsequently proved most gracious in certain female company, as testified by Anna Jameson after her visit to Port Talbot in 1837. Furthermore, at home, he seems to have developed extraordinary ties of affection for the members of his household closest to him, his servants, and their families. In any analysis Talbot’s character is obscured by one overriding enigma – his voluntary exile to Upper Canada. This enigma persisted, for he clearly cherished his British background and sought out British company both in Canada and by returning to Britain on six occasions after 1803. The achievements of Thomas Talbot are embodied in the settlement named for him. The vast region he supervised, particularly along the Talbot roads, was better developed in terms of agriculture and commerce than most of the rest of the province. The best features of his system of land supervision, such as the roads, were never implemented in settlements elsewhere in Upper Canada. He worked alone and placed himself above everyone, alienating most provincial officials by his apparent avarice for land and by his direct recourse to the imperial government. Nevertheless, for several decades, the benefit to the province which resulted from Talbot’s solitary, honest supervision far outweighed the personal benefits he enjoyed. [Thomas Talbot’s remarkable career has attracted the attention of several biographers from the 1850s to the present. The first biography, by Lawrence Cunningham Kearney, The life of Colonel, the late Honorable Thomas Talbot, embracing the rise and progress of the counties of Norfolk, Elgin, Middlesex, Kent and Essex . . . (Chatham, [Ont. ], 1857), was a brief anecdotal tribute. Despite differences in political viewpoint between them, the reform-minded author credited Talbot with much of value. Of all the biographers, Kearney may have been the most perceptive in correctly identifying Talbot’s unique political stance – neither tory nor reform in character. Another contemporary description, Life of Colonel Talbot, and the Talbot settlement . . . (St Thomas, [Ont. ], 1859; repr. Belleville, Ont., 1972), was by Edward Ermatinger*, an acquaintance and associate. This somewhat longer – and largely anecdotal – biography included a description of the Talbot settlement. 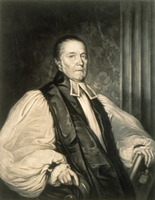 Ermatinger shared many of Talbot’s conservative views although he attributed the latter’s flaws to lack of religious guidance. 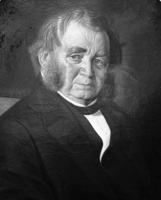 Charles Oakes Zaccheus Ermatinger, a son of Edward, published a substantial biography, greatly expanding upon his father’s work. The Talbot regime; or the first half century of the Talbot settlement (St Thomas, 1904) was a more scholarly account although not critical of its subject. It incorporated a reprinted collection of Talbot’s correspondence. Brief biographies appeared in the Cyclopædia of Canadian biography (Rose and Charlesworth), vol.2, in 1888, and in 1898 in the DNB. A somewhat more critical view of Talbot was produced as part of an annotated collection of documents published as The Talbot papers (2v., Ottawa, 1908–9). The editor, James Henry Coyne*, was the grandson of an arch-foe of Talbot in the township of Dunwich, their mutual abode. Coyne achieved some objectivity in his biography. His principal criticism was the unjust treatment of the Scottish settlers of Dunwich and Aldborough townships who received only 50 acres and were effectively isolated behind Talbot’s large undeveloped landholdings. Another descendant from the Coyne family line, Fred Coyne Hamil, wrote a most scholarly biography of Talbot entitled Lake Erie baron: the story of Colonel Thomas Talbot (Toronto, 1955). A wide range of archival materials was tapped in Hamil’s work. The result was a detailed chronological account of Talbot’s career and a substantial sketch of the evolution of the Talbot settlement. Thomas Talbot’s “Remarks on the province of Upper Canada; by the founder of the ‘Talbot settlement’” were published as app.B of G.B., Parl., House of Commons paper, 1823, 6, no.561: 1–203, Report from the select committee on the employment of the poor in Ireland, 175–78. PAC, RG 1, E3, 87; RG 68, General index, 1651–1841: 418, 542. PRO, CO 42/330: 203. [E. P. Gwillim] Mrs J. G. Simcoe, The diary of Mrs. John Graves Simcoe . . . , ed. 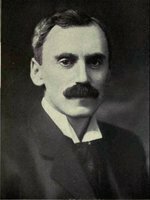 J. R. Robertson (Toronto, 1911; repr. ), 62. Murphy, Winter studies and summer rambles. John Strachan, John Strachan: documents and opinions; a selection, ed. J. L. H. Henderson (Toronto and Montreal, 1969), 66. Weekly Dispatch, St. Thomas, Port Stanley, and County of Elgin Advertiser (St Thomas), 15 Feb. 1853, 26 April 1855. Burke’s peerage (1970), 2607. “Calendar of state papers,” PAC Report, 1936: 525–26, 552. G.B., WO, Army list, 1784–1801. “State papers – U.C.,” PAC Report, 1891: 32–33; 1892: 288, 298–99; 1893: 10–12; 1896: 21–24, 36; 1898: 211, 213; 1943: 106–7; 1944: 10. A. G. Brunger, “A spatial analysis of individual settlements in southern London District, Upper Canada, 1800–1836” (phd thesis, Univ. of Western Ont., London, 1974). Cowdell, Land policies of U.C. Craig, Upper Canada. E. N. Lewis, Sidelights on the Talbot settlement (St Thomas, 1938). W. H. Murch, Talbot settlement centennial celebration, May 21st to 25th, 1903, Saint Thomas, Ontario (St Thomas, ). Wayne Paddon, The story of the Talbot settlement, 1803–1840: a frontier history of south western Ontario (rev. ed., [St Thomas? ], 1976). Read, Rising in western U.C. 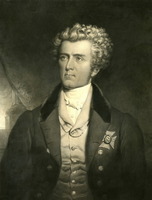 W. R. Riddell, The life of John Graves Simcoe, first lieutenant-governor of the province of Upper Canada, 1792–96 (Toronto, ), 143. Paul Baldwin, “The political power of Colonel Thomas Talbot,” OH, 61 (1969): 9–18. J. H. Coyne, “An address at the unveiling of the Port Talbot memorial cairn,” OH, 24 (1927): 5–9; “Colonel Talbot’s relation to the early history of London,” OH, 24: 10–16. F. C. Hamil, “Colonel Talbot and the early history of London,” OH, 43 (1951): 159–75; “Colonel Talbot’s principality,” OH, 44 (1952): 183–93. Archibald McKellar, “Recollections of Col. Talbot and his times; sacrifice of the public domain,” Wentworth Hist. Soc., Papers and Records (Hamilton, Ont. ), 1 (1892): 115–19. Colin Read, “The London District oligarchy in the rebellion era,” OH, 72 (1980): 195–209. F. T. Rosser, “Colonel Thomas Talbot vs John Nixon,” OH, 38 (1946): 23–29. Alan G. Brunger, “TALBOT, THOMAS,” in Dictionary of Canadian Biography, vol. 8, University of Toronto/Université Laval, 2003–, accessed April 20, 2019, http://www.biographi.ca/en/bio/talbot_thomas_8E.html.